Making a giant heart-shaped chocolate chip cookie during the week leading up to Valentines Day has become a tradition over the last couple of years. I use the Toll House recipe minus the nuts. I will admit that the last 2 years I have done something I normally don’t do, I bought the frosting. If you are going to use store bought frosting to decorate with, buy the whipped frosting as it pipes much easier. I use the Wilton 12″ heart-shaped pan. I spray the pan with Baker’s Joy before baking so that the cookie doesn’t stick. 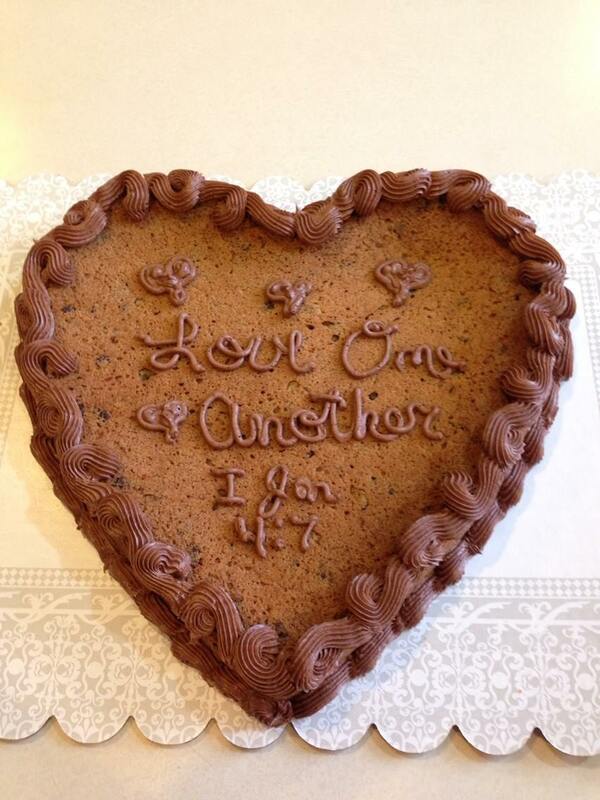 The size of the cookie requires a cake board that can be found in the cake decorating section of craft or fabric stores like JoAnn’s, Michael’s, Hobby Lobby, even Walmart. To transport, I use a Rubbermaid container. COMBINE flour, baking soda and salt in small bowl. Beat butter, granulated sugar, brown sugar and vanilla extract in large mixer bowl until creamy. Add eggs, one at a time, beating well after each addition. Gradually beat in flour mixture. Stir in chocolate chips. Spread in 12″ heart shaped pan that has been sprayed with cooking spray that has flour, like Baker’s Joy. BAKE for 20-25 minutes or until golden brown. Cool approximately 20 minutes. Remove from pan onto cake board. Cool completely. Decorate as desired. I use tip 5 for writing and hearts. If making hearts, pipe your outline then fill. For the borders, I use tip 32 to do a reverse scroll on top and a scroll on the bottom.